We love how this sweatshirt tunic is the perfect combination of casual and cute--this would look adorable paired with leggings and boots on days when you want to stay comfy. The Lace Sleeves Sweatshirt Tunic is made of a soft sweatshirt fabric in heather gray. The sleeves are made of semi-sheer ivory lace. 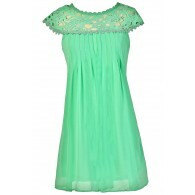 This top has a longer length so that you can wear it with leggings. The Lace Sleeves Sweatshirt Tunic is perfect to toss on when you're lounging around the house, running errands, or heading to class. Details: 100% rayon. Hand wash cold water separately. Color will bleed. No bleach. Hang to dry. Small measurements: Length from top of shoulder to hemline: 33". Bust: 34". You have added Lace Sleeves Sweatshirt Tunic in Heather Grey into Wishlist. You have added Lace Sleeves Sweatshirt Tunic in Heather Grey for Stock Notification. 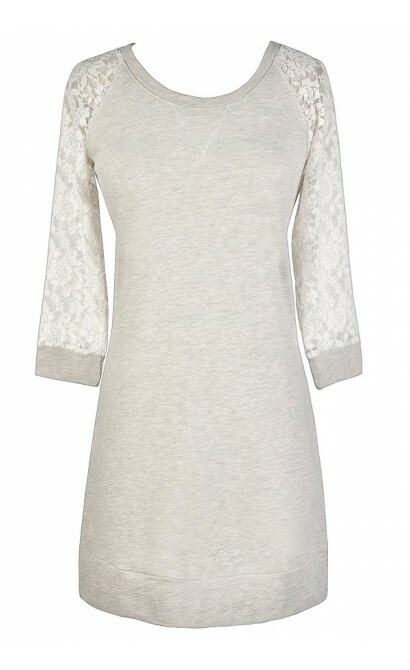 You have set Lace Sleeves Sweatshirt Tunic in Heather Grey as a loved product. You have removed Lace Sleeves Sweatshirt Tunic in Heather Grey as a loved product.